After a day and a half of traveling to Italy from the US, and two and a half days in Cinque Terre, it was finally time to move on to Florence and then to Fattoria Bacio, in Certaldo, where I would teach two week-long sketching workshops. My friends Cindy and Carol watch the scenery going by on our way to Florence. Notice how our suitcases are all stashed in and among the train seats. That was the only place to put them on this train. The train trip from Cinque Terre to Florence was one I had been dreading. I had two suitcases I had to lug along, one with my clothes, shoes, etc. and one with the handouts and supplies for my workshop classes. I give each student in my European workshops a huge spiral-bound book filled with great ideas for designing their sketchbook pages, creating border designs, and adding hand-lettering to their sketches. I also include lessons on perspective, composition, and watercolor techniques, along with other helpful information. My students love their handouts, but since I was teaching a total of twenty people this year, those handouts and supplies added up to a hefty 47 pounds! It would have cost a fortune to ship everything, so I bit the bullet and took everything with me. Luckily, I was traveling with nine friends who helped me every step of the way. "Many hands make light work" - that definitely applied to getting all of our bags up and down stairs and on and off trains during our day of traveling to the workshop location in Certaldo. It was all part of the traveling experience, so it merited a page in my travel journal. Have you noticed that I like variety in my sketchbooks? Some pages are cute or funny or cartoonish like this one. Others are heartfelt, beautifully painted images that I lavish time and attention on. Some are tongue-in-cheek or silly, while others are serious. I guess I like to mix things up. I get bored doing the same thing the same way, so I constantly try to think of new ways to approach the sketchbook page. It pushes me to learn and grow. Give it a try! You are invited to enter for a chance to win a set of five American Journey Interlocked Synthetic Brushes (a $38.69 value) plus a handy Cheap Joe's Folding Brush Holder (a $14.69 value), courtesy of Cheap Joe's Art Stuff. These are the same brushes I used on my recent trip to Italy. I have the shorter travel version, and they fit nicely in my travel sketch kit. I really enjoyed painting with them in Tuscany - they hold plenty of water, and they're a little springier than my sable brushes. To enter the giveaway, all you have to do is leave a comment on one or all of the seven sketches I'll be posting between November 27 and December 3. It's okay if you enter multiple times (one per post, please). The drawing will be held on December 7, 2016. What tutorial would you like to see here on the Everyday Artist blog? Leave your answer in a comment below. Good luck! I'm glad I took the time to journal on this trip to Italy. It does take some effort to make time to write things down each day, but it's amazing how quickly we forget the details if we don't record them in some way. Each day blurs into the next and you can't rmember where you went or what you ate or even what day it is! And a travel journal with sketches is even better than one without, don't you think? 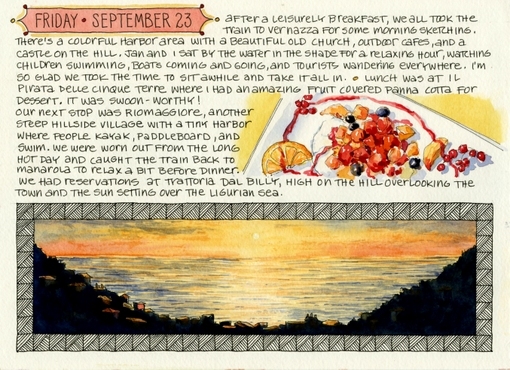 Just looking at this sketch of our last sunset in Manarola takes me back there. Dining at a restaurant high up on the hill above Manarola, with all of the houses below glowing in the setting sun, the sky turning every shade of pink, orange, and blue - it's something I'll never forget. And don't you forget about our DECEMBER GIVEAWAY! 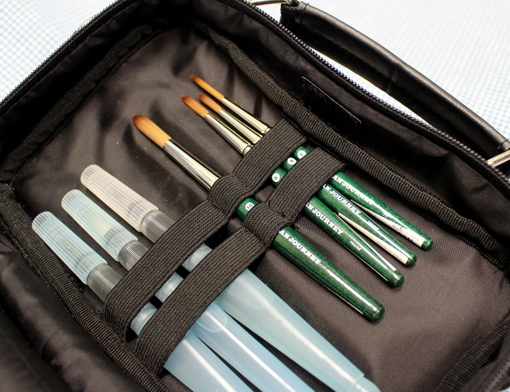 Enter for a chance to win a set of five American Journey Interlocked Synthetic Brushes (a $38.69 value) plus a handy Cheap Joe's Folding Brush Holder (a $14.69 value) to keep them all in, courtesy of Cheap Joe's Art Stuff. To enter the giveaway, all you have to do is leave a comment on one or all of the seven sketches I'll be posting between November 27 and December 7. You may enter multiple times. Just leave a comment on all seven posts. The drawing will be held on December 3, 2016. Leave a comment below. Good luck! When I visited Italy in September, I only had two full days to explore the towns of Cinque Terre, but we managed to see four of the five villages, and that was without rushing around too much. We had leisurely lunches and hours of meandering, plus time spent sketching. 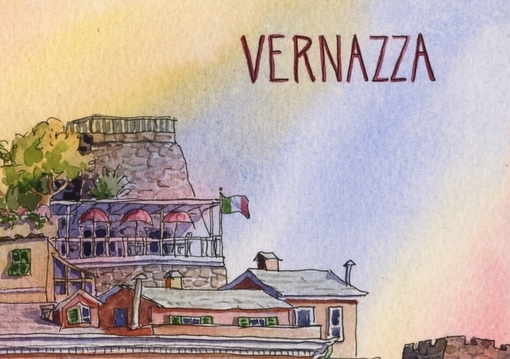 One of my favorite experiences was sitting at the harbor in Vernazza with my friend Jan, sketching the old buildings that hug the seaside. It was so quiet and relaxing, just sitting, chatting, drawing, watching, and absorbing it all. That's the way I like to travel. 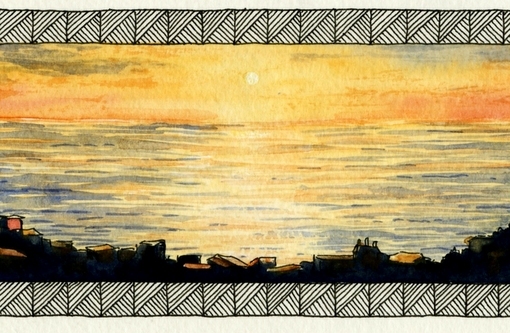 10" x 7" ink & watercolor in Handbook Field Watercolor Journal. Drawn with a Platinum Carbon fountain pen filled with Platinum Carbon black ink. 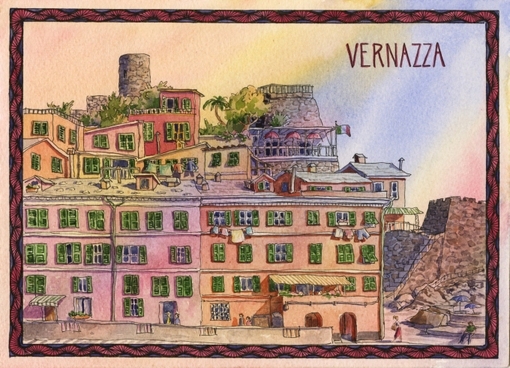 I completed the drawing of the Vernazza harborside buildings onsite, leaving room around the edge of the page for a border to be added later. When it came time to paint the sketch, I decided to give the whole page a base wash of color. I wet the entire page with clear water, then brushed on streaks of primary colors (Permanent Rose, Ultramarine Blue, and Yellow Ochre). Tilting the page, I allowed the colors to run and blend, spraying with a fine mist of water when I wanted the color to move more. When I was pleased with the look of the wash, I let it dry completely. I like how a colorful underwash unifies a page. It also serves as the lightest color for some of the objects on the page. So when you begin painting your sketch, some of the work is already done for you. All you have to do is add the mid-tones and darks. I usually save the border design for last, so I can choose a style that complements my sketch. This time I chose a Zentangle design that I found on Pinterest. 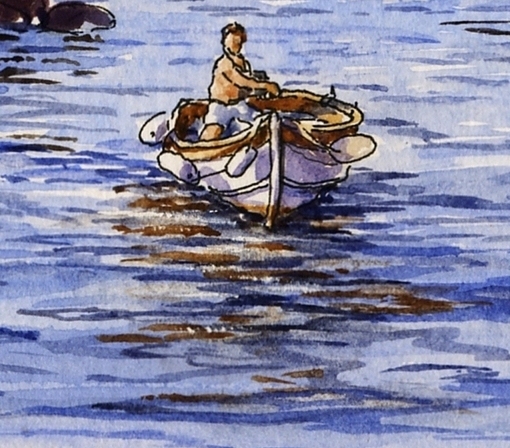 I drew it with my Platinum Carbon fountain pen, then painted it with the same colors I had used in my sketch. It coordinates with the sketch but still provides enough contrast to frame it nicely. 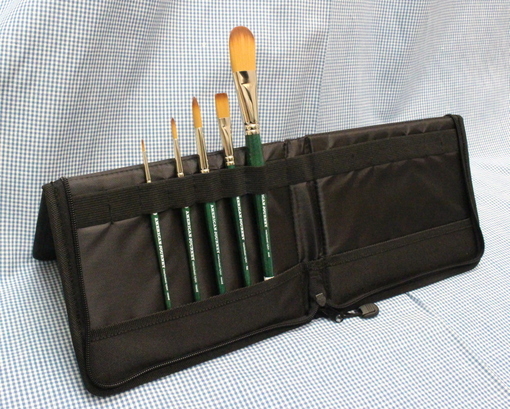 You can enter for a chance to win a set of five American Journey Interlocked Synthetic Brushes (a $38.69 value) plus a handy Cheap Joe's Folding Brush Holder (a $14.69 value) to keep them all in, courtesy of the friendly folks at Cheap Joe's Art Stuff. To enter the giveaway, all you have to do is leave a comment on one or all of the seven sketches I'll be posting between November 27 and December 3. Yes, you may enter multiple times! What is your favorite way to be creative? 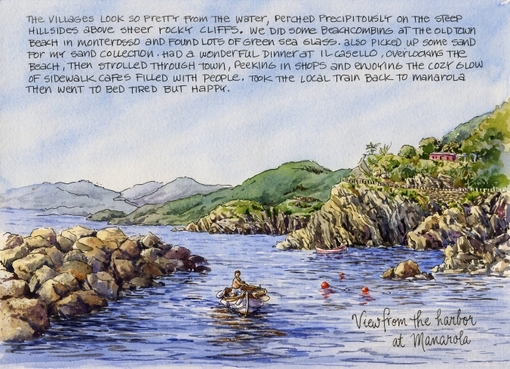 Manarola Harbor Sketch + GIVEAWAY! 10" x 7", Ink & watercolor. Ink drawing done with Platinum Carbon desk pen. Handbook Field Watercolor Journal. I drew this as we were waiting for the ferry boat to arrive and take us on a scenic tour up the coast. My friends and I were lined up, along with at least fifty other tourists, on a narrow rocky path that wound around the cliff at Manarola harbor. 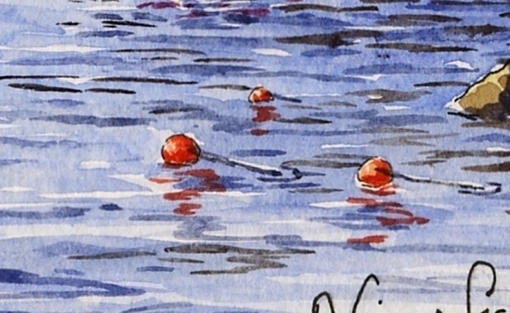 I held my breath every time someone tried to squeeze past me, hoping neither one of us would tumble into the water, especially since I was holding my sketchbook! I only had time for a quickie ink drawing before the ferry arrived, so I painted the sketch back at home. I started with the sky and the distant hills, then gradually moved into the mid-ground and foreground. For the water, I painted a base wash of light blue (mostly Cobalt & Cerulean), leaving some areas of white for highlights. After the base wash on the water was dry, I added darker lines with a flat brush to show the movement of the water and the reflections. The boulders in the breakwater were painted with a base of warm Yellow Ochre in the sunny areas and a more muted pale gray in the shade. 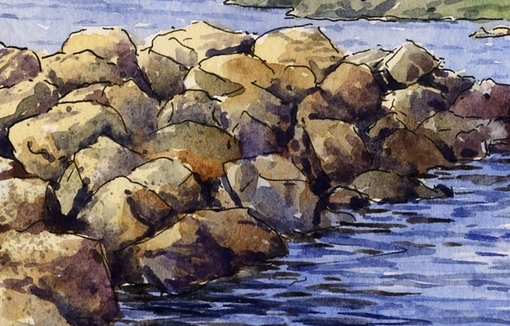 Glazes of medium and dark values added depth and form to the rocks. A touch of spattering was used to indicate texture. The cliffs were handled in a similar manner, layering washes and adding detailing at the end. 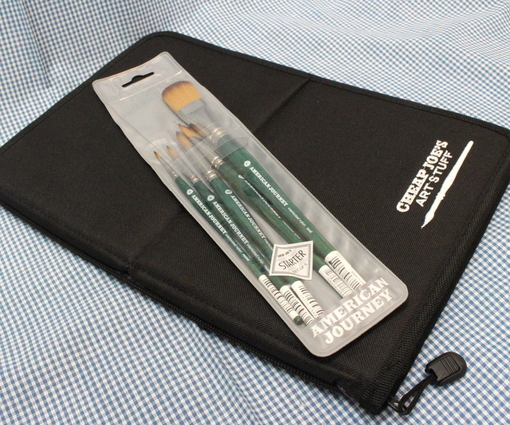 Enter to win a set of five American Journey Interlocked Synthetic Brushes (a $38.69 value) plus a handy Cheap Joe's Folding Brush Holder (a $14.69 value) to keep them all in, courtesy of the friendly folks at Cheap Joe's Art Stuff. These are the same brushes I used on my recent trip to Italy. I have the shorter travel version, and they fit nicely in my travel sketch kit. I really enjoyed painting with them in Tuscany - they hold plenty of water, and they're a little springier than my sable brushes. I like that. To enter the giveaway, all you have to do is leave a comment on one or all of the seven sketches I'll be posting between November 27 and December 3. Yes, you may enter multiple times! The drawing will be held on December 7, 2016. The olive oil from Fattoria Bacio (the estate that hosts my workshop in Italy) is the best I've ever tasted! During our week at the villa, the students and I sloshed it over just about everything at dinner each night: bread, pasta, salad, meat, and vegetables. And by the end of the week, we all joked that it had magical properties, because it seemed that none of us had gained any weight, despite the fact that we were eating a multi-course meal at the villa each evening. 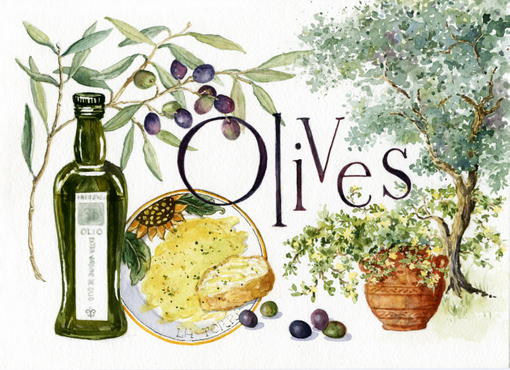 Now, that's some good olive oil! 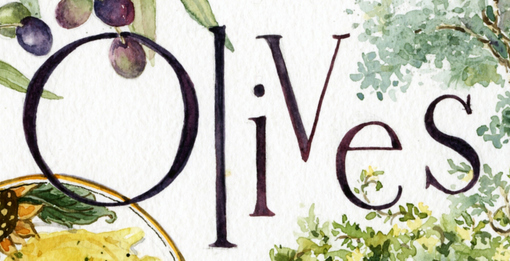 So I dedicated a page in my journal to the wonderful olives grown at Fattoria Bacio. 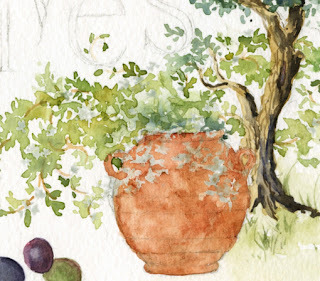 The sketch includes a bottle of olive oil, a plate with herb-infused oil and bread, an olive branch laden with fruit, an olive tree, and a vintage olive oil jug filled with flowering vines. The sketch was drawn while I was at the villa, sitting in the shade of the big chestnut tree in the courtyard on a warm, sunny afternoon. 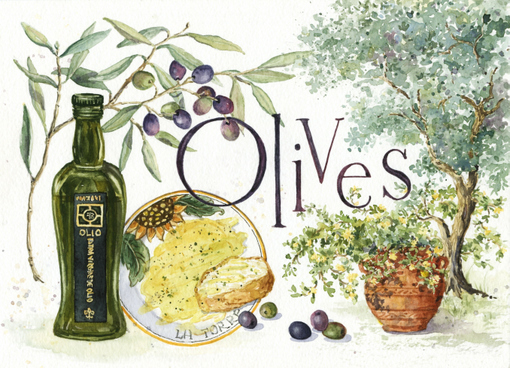 One of my favorite students, Karen, was doing her own olive oil page, and it was so nice to sit there painting and chatting, with that amazing view of the Tuscan hills spread out before us. 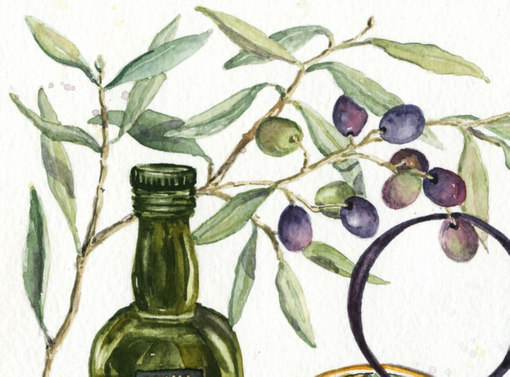 Can you see the line drawn down the center of the olive oil bottle? When I have to draw something that's symmetrical, like this unusually shaped bottle, I draw a vertical line right down the center of the object. That makes it easier to compare the left and right side and make sure they match. Since I didn't have time to paint the sketch that day at the villa, I thought you might enjoy seeing how I tackled it, one step at a time, when I got back home, using the photos I took that day for reference. 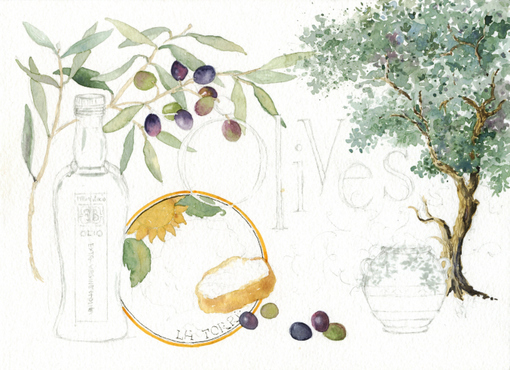 I began with the olive tree, dabbing on paint with a round brush to suggest the fine texture of the olive leaves. Olive trees can vary in color from a yellow-y green to a more bluish gray-green. To mix the color, I usually start with a Cerulean Blue base, then mix in some green (like Sap Green), then mute it with Burnt Sienna or Payne's Gray. Cobalt Blue + Sap Green + Burnt Sienna works well, too. I brushed on the lightest values first, then dropped in darker values to blend wet-in-wet. In some places, I added pure Cerulean Blue, and in others, Moonglow (Daniel Smith) to make things more interesting and hint at shaded areas in the foliage. After the first washes dried, I added more marks to suggest leaves, using darker values. The tree trunk was painted with mixtures of Yellow Ochre, Burnt Umber, and Ultramarine Blue. 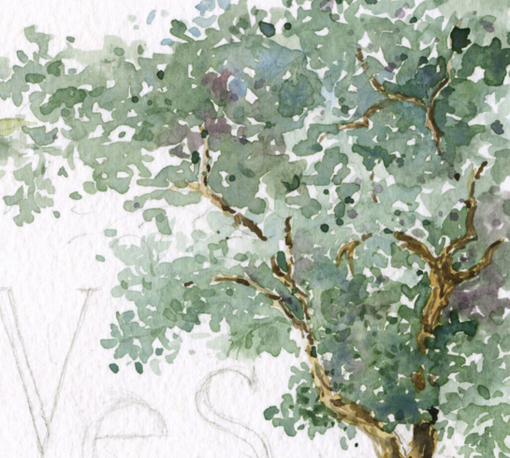 The leaves on the olive branch were painted with the same colors I used for the tree foliage, but I varied the individual leaves, making some bluer, others warmer, or lighter, or darker. 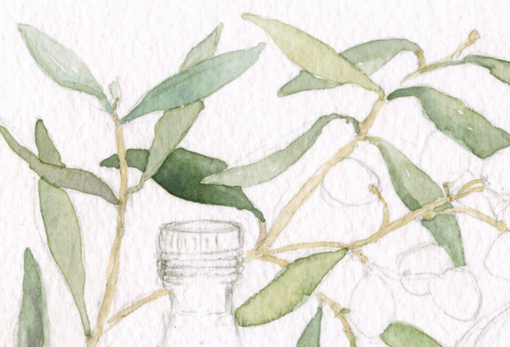 For the lighter yellow-green leaves, I added Yellow Ochre or Cadmium Yellow Light to the gray-green mixture. 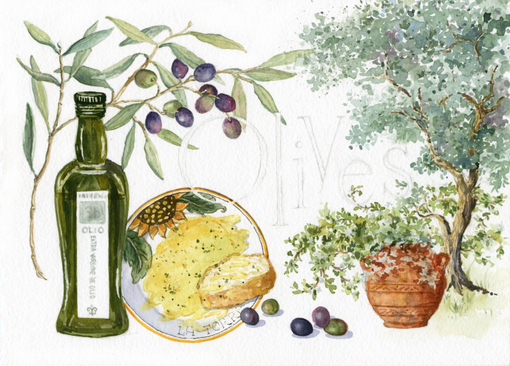 I continued painting initial washes in light and medium tones on the olives and plate. Step 3 - Add more washes. Mask where needed. 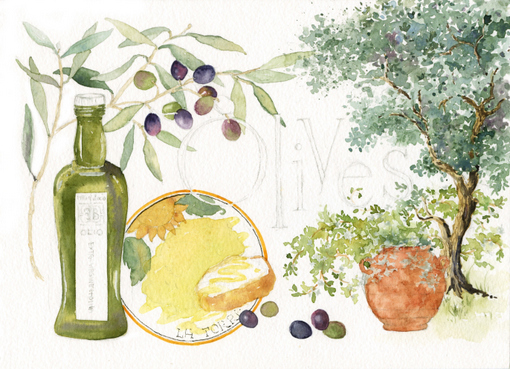 The colors of the olives ranged from warm yellow-green to red to deep dusky purple. I painted them with a variety of colors - Olive Green, Shadow (American Journey), Moonglow (Daniel Smith), Permanent Alizarin Crimson, and Quinacridone Violet. 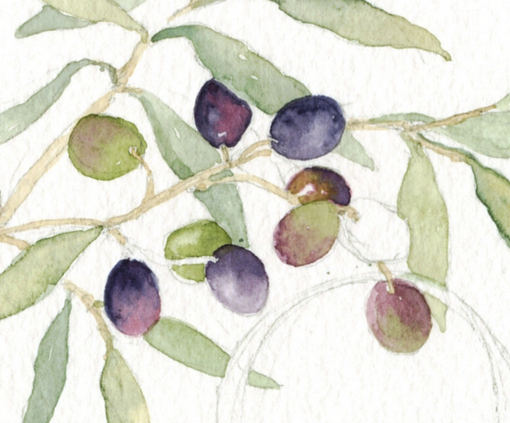 I let the paint colors mingle wet-in-wet to mimic the variation I saw in my photo of the olives. Highlights were lifted out of the wet paint in places with a damp brush. The antique olive oil urns at Fattoria Bacio haven't held oil since the 1970s. Now they're used as huge planters, filled with flowering vines. Since I wanted to show the vines cascading down over the urn, I used a round brush to paint on masking fluid (I use Pebeo brand) and preserve the white paper so I could easily paint the rusty color of the vessel without having to paint around the tiny leaves. I also masked some highlights on the olive oil bottle. 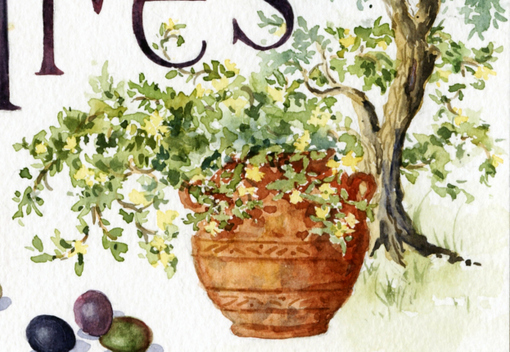 Next, I painted the first washes on the bottle, terra cotta urn, and flowering vine. 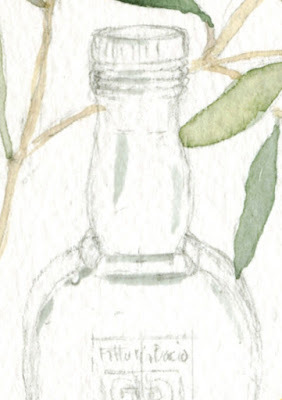 A mixture of Payne's Gray and Cadmium Yellow Light was perfect for the olive oil bottle. I varied the wash by brushing in areas of yellow and purple. I also left a couple more slivers of unpainted white paper for additional highlights. When I started painting the vine, I suddenly realized that I should have masked out a few flowers first, up in the area above the urn, so I paused to do some masking. After it dried, I continued painting the vine with a round brush. I used Olive Green and Yellow Ochre plus a little Cobalt Blue in spots. 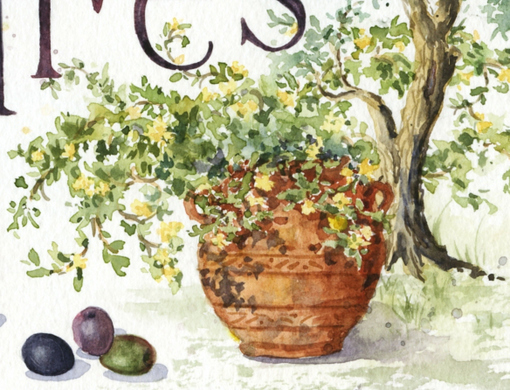 The yellower colors in the vine helped to differentiate it from the olive tree, with its bluer tones. In the next step, I began to pull everything together, adding darker values and details to the sketch. Darker streaks of green were added to the olive oil bottle to indicate the varied reflections in the glass. I used the same Payne's Gray/Cadmium Yellow Light mixture that I had earlier, but with less water, so it would be darker and more intense. 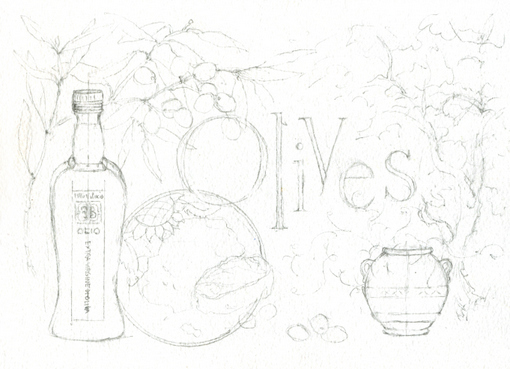 At this point, I also needed to think about how I was going to paint all the gold lettering on the black olive oil label. I decided to mask out the lettering with masking fluid using a small round brush. The lettering didn't need to be perfect. It was just a suggestion of what was there. 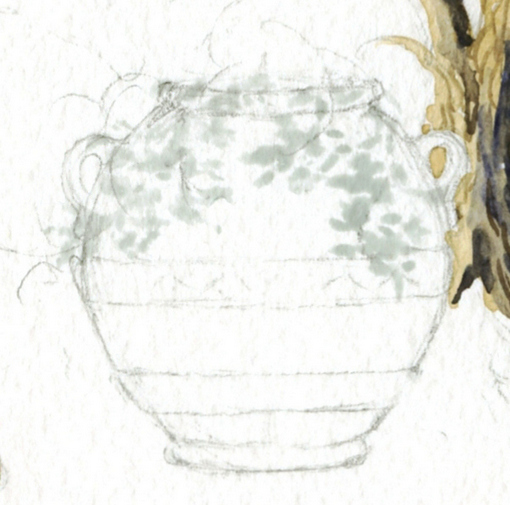 Next, I added some darker leaves to the mass of green vines and did some detailing of the pattern on the urn. Shadows were painted on the urn and cast shadows were added under the olives. 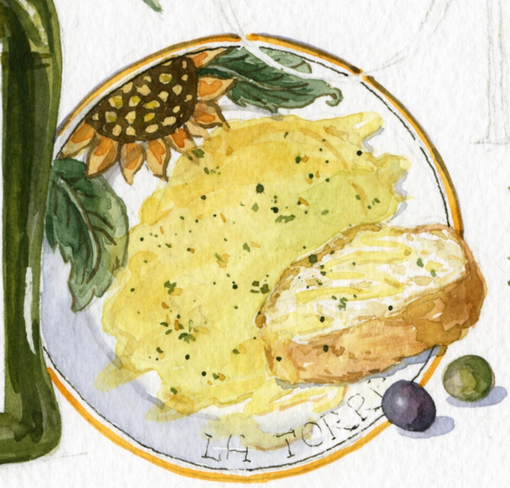 The floral pattern on the plate was finalized and the herbs on the oil and bread were painted. To make the marks look irregular, I used spattering for some and painted others with a small round brush. 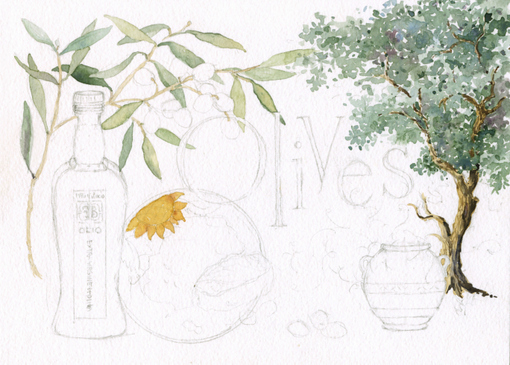 Subtle detailing was added to the olive leaves and twigs, and a few shadows were painted on the olives themselves. This is the stage in the sketching process where I usually begin to think about painting the lettering. I like to have most of the sketch painted before deciding on what colors to use for any text. Here, I thought a deep, dark, dusky purple color (like ripe Fattoria Bacio olives) would be just perfect. Then it was time to work on the vines. I removed the masking fluid on the flowers and painted them a pale yellow. Next, the highlights I had masked off earlier on the bottle were revealed. They look rather harsh, don't they? In the next step I'll take care of that. To fix those harsh white areas on the bottle, I went in with a damp brush and gently rubbed along the hard edges of the white highlights to soften them and bring a little bit of the surrounding color onto the light area. It made the highlights look much more natural, don't you think? After that, I painted the label on the bottle with a rich mixture of Payne's Gray and Ultramarine Blue. After it dried, I lifted off the masking fluid and painted the lettering with a Yellow Ochre/Raw Sienna combo. and some dimples on the olives. 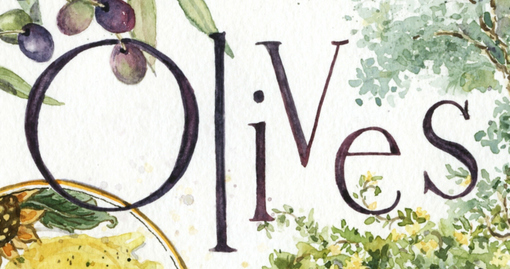 I decided to lighten some areas on the "Olives" lettering, so it didn't look so solid and dark, so I lifted a bit of the paint with a damp brush. The branch needed a few final touches. 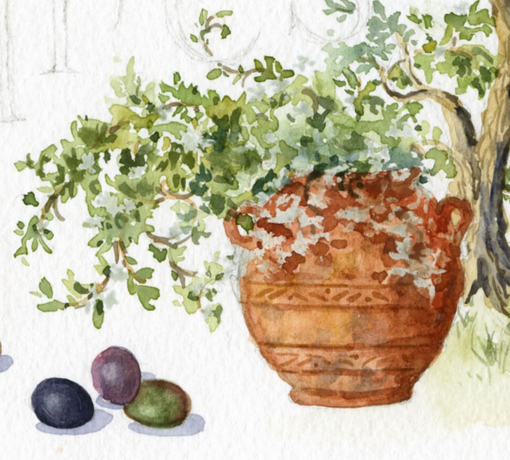 I added some cast shadows on the leaves and painted the shadows where the stems attach to the olives. A little spot of dark value can really make something pop. And that's about it. This little 10x7 sketch took me quite a few hours to complete, but I enjoyed working on it and remembering those idyllic autumn days I was lucky enough to spend at Fattoria Bacio, painting with my friends, eating wonderful food, and just relaxing in a place that makes me so very happy. I think all the women who accompanied me to Tuscany this year would agree that there's just something so special about that place and the time we spent together there. It's impossible to describe. There was joy and happiness and excitement and wonder all wrapped up together in a beautiful package. It was the best of times. I'll be returning to Fattoria Bacio to teach again next year, and the workshop still has a few openings. Come sketch with me September 23-30, 2017. It will be one of the best weeks of your life! (Click here for more information.) And don't forget about my Provence and Greece trips, too. 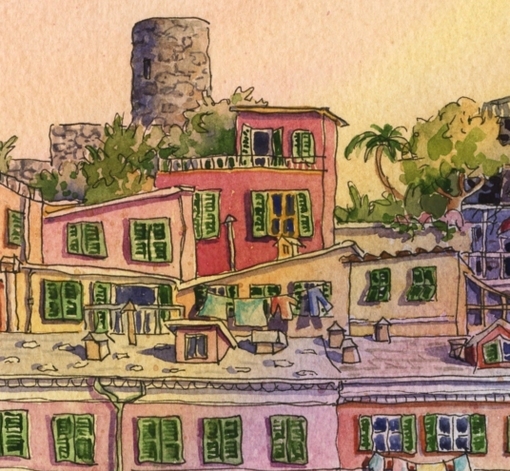 Lots of great options for those who love to combine sketching with travel, like me! 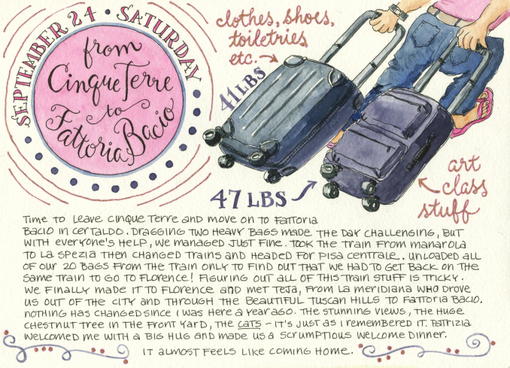 Italy Sketchbook -- Travel is NOT for Sissies!